A man charged with theft of a 75hp Yamaha outboard motor faces four years at the Stock Farm State Prisons whenever local law enforcement officers can put their hands on him. Marcus Mathew failed to show up for his arraignment at the opening of the May 2013 criminal assizes as was also the case in January. 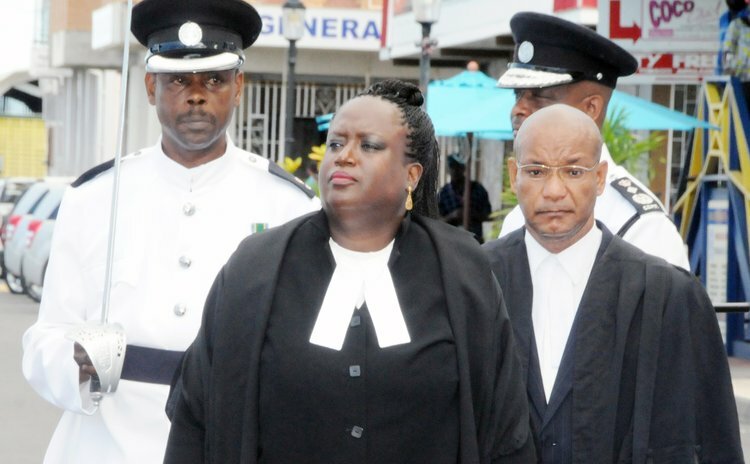 Resident judge Justice Birnie Stephenson decided to go ahead with the trial of Matthew in his absence on Tuesday May 21, 2013. State Attorney Arthlyn Nesty conducted the trial for the State before a jury of six men and three women. Fisherman Richardson Baron of Clifton told the court that he owns a 21-foot plywood fibre glass board with a red and blue outboard motor valued at $16,000. Baron said he left the engine in his motor house at Capuchin Bay on May 23, 2011 and later discovered that it was stolen. Corporal Edward Thomas investigated the theft and later charged Matthew with theft of the motor and fuel tank. While sentencing Matthew in his absence, Justice Stephenson noted that he had no previous convictions, but his offence was serious because he had taken away Baron's ability to earn a living, his means of supporting his family. She sentenced Matthew to four years in prison and ordered the return of the engine to its owner immediately. The jury needed less than 10 minutes to arrive at a guilty verdict. In another matter against Matthew, in which he is charged with handling stolen goods, the state decided to discontinue the matter after a close look at the deposition.